it's a good Bruce Willis action movie but nothing spectacular. Secondly it really didn't sell the storyline like the first movie did with Charles Bronson. Just one word..... nerd-vana. If you're any kind of nerd growing up in the 60s and 70s, you'll love it. Missing some details leading into this film. Thought I had seen all the pre-reqs, but I guess not. Anyway, they tried to mix the comedic with the serious and I'm not sure it always worked. Still very good, exciting, definitely need a scorecard. Fly Boys. 5/5. Just finished watching. Based on true story from WWI. I think it has a whole new meaning in present time; considering present time events. ... Still very good, exciting, definitely need a scorecard. Netflix had it for free so I killed a couple hours watching it. The movie was ok but it left me with the question... Why are they fighting Thanos? 1) How did those birds not drown in the rapids? 2) Why does Sandra Bullock look more and more like Michael Jackson? Clint's still got it. He plays pretty much the same character he's been playing for about a decade now: grumpy old cuss, estranged from his family. But it's an entertaining movie and I didn't fall asleep. A Star is Born. Finally watched it yesterday. It was...okay. Maybe with all the hype it got, I was expecting more. Lady Gaga and Bradley did a great job with the music, but, I knew what was going to happen 20 minutes into the movie. Not a bad movie, but, imho, not Oscar worthy. "He's Out There", Netflix 2018. One out of five. Description I saw somehwere said "An even better Cabin in The Woods" than Cabin in The Woods. Pretty sure that person knows nothing about Cabin in The Woods beyond the title, because this movie, unlike Cabin in The Woods, SUCKED. This movie sucked SOOOOOOOOO BAD. If you have axe murdered a convent full of nuns and then moved on to the local orphanage and need penance, then watch this, it should get you right into heaven. For the millionth time. I put it on and promptly fell asleep. Woke up to the credits. The Mule - 3.75/5. Based on a true story. Not sure how many more movies Clint has in him. Last one a remake of "Buried Alive" in 4K. Got a free sneak preview of 'The Best of Enemies' last weekend at the theater on base. It won't be released until April 5th, but it is well worth seeing. Very well acted and highlights the racial tensions in the early 70s, especially as incited by the KKK. I also learned a new word: charrette. It means "a meeting in which all stakeholders in a project attempt to resolve conflicts and map solutions." Spiderman: Into the Spiderverse. Great, loved it. Gotta be a fan, though, I think. I have it, haven't gotten a chance to watch it yet. 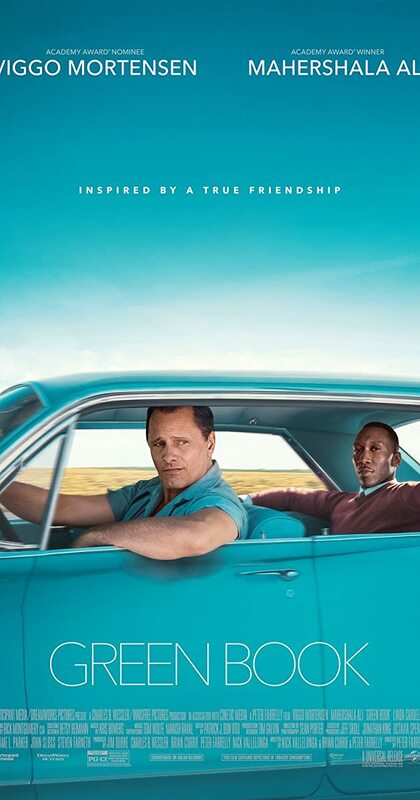 Green Book. Other than the troubles actually watching via PPV on ABB, it was an excellent movie. 5 stars! Took Granddaughter to see Dumbo this morning.. I cried a little..